BLOOMINGTON, Ind. 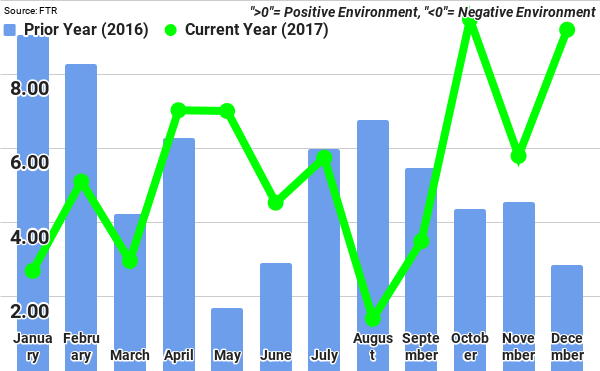 – Trucking conditions in the U.S. improved in December, with a strong 9.2 reading of the FTR Trucking Conditions Index. The index reflects a full capacity environment, driven by continued strength in freight demand, FTR reported. The industry forecaster expects the index to remain strong, and to strengthen further, in 2018. FTR says trucking capacity is “essentially maxed out,” resulting in the strongest freight rates in years. So now these companies go out and add more trucks,thus driving the rates back down.It’s a vicious cycle that keeps repeating itself.When will they learn?